Naat is Islamic poetry to praise and honor Prophet Muhammad, may peace be upon him. Due to the respect in the content Naats are some sometimes called Naat e Sherif, Naat e Mubarak , Naat e Pak etc. All these roughly translates to Noble Naat, Holy Naat Nasheed and Naats go hand in hand. 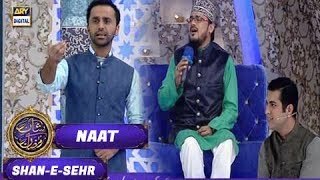 While in the strict sense Naat is in the honor of the Prophet ( SAWS), Nasheeds ( there are other variations such as Nasyid) are singing based on Islam. It will cover a wide spectrum of Islamic teachings, history etc. Sometimes Nasheed is used refer to Naat. Naats are obviously very popular in Islamic countries. However, Urdu and Arabic Naats are even popular.